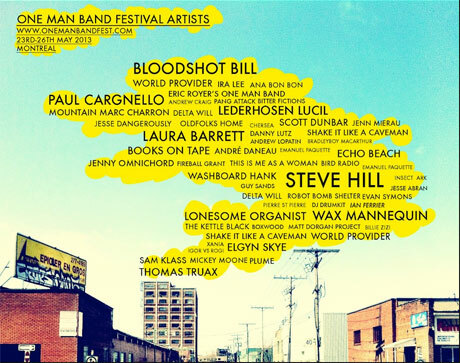 Last year, the inaugural instalment of Montreal's One Man Band Festival celebrated solo performers with a multi-day event. This spring, the festival will return from May 23 to 26 with another program focused on individual artists. This year's shindig promises to be a bigger event than its predecessor, since it boasts 50 artists in 12 venues (that's up from the 23 artists in four venues last year). The acts so far include Wax Mannequin, Laura Barrett, Paul Cargnello and Montag, with many more yet to be revealed. UPDATE: You can now see the full lineup over here. The festival was organized by former Dears member Jon Cohen. Show tickets are between $10 and $20, while all-access festival passes are $100. The One Man Band Festival is a unique new music festival that celebrates and showcases the talents and creativity of one-man/woman band musicians and performers the likes of loop artists, singer songwriters, DJs, and other forms of solo performance. For reasons of feasibility, creative expression, financial limitations and technological advancements in music production, artists today are finding new ways to express their output by recording, touring and performing alone! This festival aims to showcase their talents and support the one-man/woman band phenomenon! You can get more information about the lineup and the event here.